So I learned a long time ago that sometimes when we think we are feeling hunger, we are actually feeling thirst. Interesting, right? I thought so, and decided I'd drink a water before eating the next time I was hungry for an afternoon snack. But, I found it was easier to plan to drink water when feeling hunger rather than actually drinking it when the time came (water just isn't appealing to me when I think I am hungry). 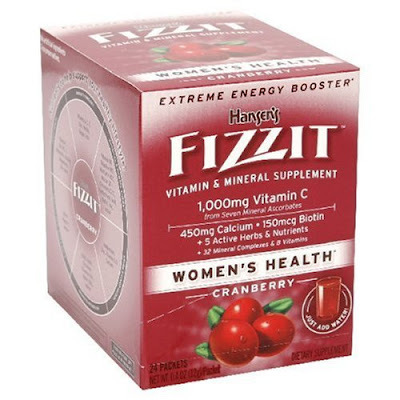 Then I discovered these yummy little packets of women's vitamins called "Fizzit" (they also come in immunity, joint and multivitamin formulas as well). You just add the fizzit powder packet to a glass of water, and within a minute you have a flavorful, vitamin packed drink that is much more interesting than plain water. Each packet is only 25 calories (or 1 weight watchers point). Drinking these is much better than eating a 150 calorie snack, and a great way to find out if you are really thirsty instead of hungry. Each fizzit packet has vitamins that promote heart health, strengthen your immune system, provide energy (or so it is claimed), and help with healthy hair, nails, bones, and joints, all good things! The cranberry flavor (my favorite) is packed with vitamin C and also has Zinc in it, both of which are great vitamins to help ward off winter colds. It also comes in Strawberry, Lemon Lime, Orange and Raspberry. What a great trick! I'll tell my sister...she hates water. Looks intriguing... I'll have to look out for these for my mom, who likes flavored water-type things. It's always good to hydrate. I know I should so more than I normally do! Thanks for the informative post! these look so delicious!!! do you know if they have any artificial sweeteners in them? i try to avoid them at all costs. i just hate the fact that i live so far away from whole foods, juliet!! haha i hardly ever go there. there's a grocery store in my town, but it carries the bare minimum when it comes to cool health foods. yeah, but what's in those packets? if i want flavored water, i'll just make it - http://www.coolwaterbook.com - i found this book on amazon.com and the recipes are simple. it's probably cheaper than buying fizzit also.